The month of May has gone past all too quickly. My EveryDay Journal was mostly ignored and I never got into the theme that we had proposed to the Facebook group. I have been contemplating whether to change my Word of the Year from Gratitude to Joy. We had a visiting speaker at church who spoke on The Importance of Joy. This is the page of notes that I made afterwards. For our wedding anniversary we had spent a couple of days away and I had done this double page journaling as soon as we got back. On the first day of June I went through my journal to finish off May. I had left blank pages to use for artwork based on the them of the Holy Spirit, but as I said earlier I had not done anything. So I went back through the information on the to-do pages and printed out photos of the textile work I had been doing that week. I wrote a blog post for the church blog which hasn't been published yet so I have hidden it in this photo. 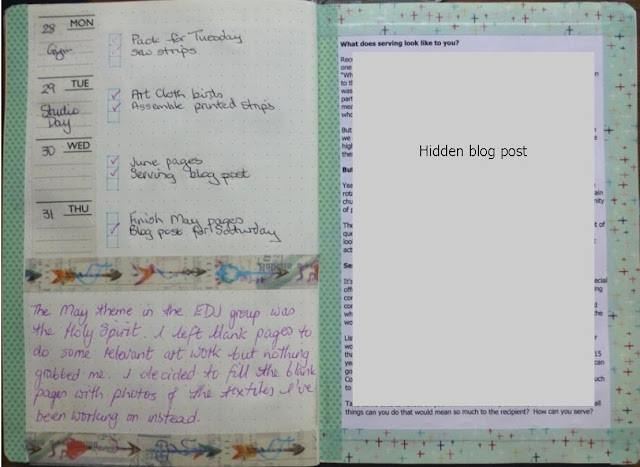 I put a copy in my journal to remind me to act on the challenge I have set in the blog post! And here is the monthly page for June. It's a piece of scrapbook paper that I have been stroking for a long time and thought I really ought to use.